Gary Vitacco-Robles is the best-selling author of Cursum Perficio: Marilyn Monroe's Brentwood Hacienda/The Story of Her Final Months and ICON: The Life, Times, and Films of Marilyn Monroe, Volume 1 &2. 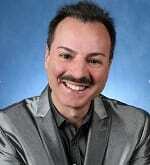 He is also a Licensed Mental Health Counselor and National Certified Counselor in practice in Tampa, Florida. He holds a master's degree in Counselor Education from the University of South Florida. For twenty-one years, Gary has provided trauma-focused treatment to children and families who have survived sexual & physical abuse or neglect and has treated youth with sexual behavior problems. He is also both the chairperson and a founding member of a sexual abuse intervention network. Since 1986, Gary has served as an advocate for both survivors of trauma and individuals managing their major psychiatric disorders and is highly qualified to talk about Marilyn’s mental health disorders.